Our trip from Turks and Caicos to the Dominican Republic took 24 hours. It was non-stop and involved night watches and sleep deprivation. But, for the first time in 10 months, our trip did not include Dramamine. And, no one felt seasick. Since we left Ottawa, I have been taking at least a half tablet of Dramamine every time we have sailed. The adult dosage is 1-2 tablets per day. My kids have been less affected by seasickness. My husband, Rick, has never shown signs of seasickness. He shaves with a machete. When we started sailing our boat in August 2015 I was very seasick. On the water, it was all I could do to feed my family. At times, they ate carrots in place of meals because it was all I could manage. With Dramamine I could function. My family ate well. But, I did feel lethargic. But, a few days ago, on my first night sail, I was falling asleep at the helm. I wanted to fully participate in the night sail but could barely manage a 2-hour night shift without having to wake up Rick, for the sake of safety. My decision to stop taking Dramamine stemmed from a conversation with another cruiser, named Fabio. We met him in Turks and Caicos. He, too, is headed for Luperon, Dominican Republic. I mentioned to him that Dramamine knocked me out. Fabio told us that he used to run regattas and that he would not allow people to take Dramamine. He preferred that the regatta participants were seasick rather than doped-up on Dramamine. So for the first time I sailed without taking seasickness medication. I was fine. I was able to take the night shift, and it fully registered when other boats flickered in the distance. In the Bahamas, I met a woman who said that she used to get seasick in her own bathtub. Now, she is a world traveller on a South African boat, called SV Alley Cat. Likewise, in her book, “The Voyage of the Northern Magic: A Family Odyssey,” Diane Stuemer describes early days where her family felt seasick. They got their sea legs and circumnavigated. It’s probably too soon to say that I have outgrown seasickness. But, I feel that I’m on my way to sailing without medication. I will keep our ample supply of Dramamine on hand just in case. But for now, it’s slated for visitors. Currently, we are anchored at Cabo Isabela, Dominican Republic (DR). It is very green and mountainous here. Here’s a picture of me and Betty, taken this morning, with the mountainous northern DR coastline in the background. 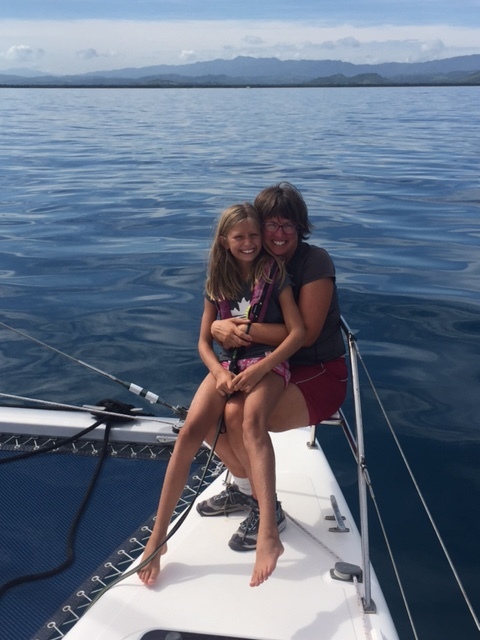 Betty (age 10) and me on SV Aphrodite near the northern coast of the DR.
We haven’t yet been ashore. We are still flying our yellow quarantine flag until we meet with DR officials. I find Stugeron really good. Doesn’t make me sleepy. I just take half a tablet too. With just the two of us we can’t really afford to get sick so I take one just in case! Can’t buy it in New Zealand so I get it from an online pharmacy in the UK. I hear I can buy Stugeron in the DR as an over-the-counter medication. Would you be willing to share your ditch bag departure list that you mentioned in a previous comment? We’d love to see it! Have you tried sea bands? My son is quite seasick (and car sick) and oddly enough they are efficient 95% of the time. Hi Lorraine , Rick and kids. Just went through your blog and truly enjoyed it. Our experience with seasickness is that we can all potentially get seasick. Some more than others, the kids are great dealing with it. When one does get seasick they just lay down, in their bunks or in the saloon. Usually, after a while they are Ok again. We do have a kid with food allergies on board as well. Not as serious as Paul’s but it is a great lesson to be made that our weaknisses are actually our strenghts as well and that they should not limit us.